The most common form of angiosarcoma is cutaneous angiosarcoma not associated with lymphedema. [3, 4] In contrast to the deep location of most soft-tissue sarcomas, angiosarcoma has a predilection for skin and superficial soft tissue on the scalps of elderly people, constituting less than 1% of all head and neck malignancies. According to Aust et al, less than 5% of soft-tumor sarcoma occurs in the head and neck, with only approximately 10% being angiosarcoma. For information on all types of skin cancer, visit Medscape’s Skin Cancer Resource Center. This disease is primarily located on the head and neck of elderly males. In one of the largest series to date, Perez et al reported on 88 patients with cutaneous angiosarcoma divided into 4 groups: 38 head and neck, 30 radiotherapy-induced, 13 sporadic trunk/extremity, and 7 Stewart-Treves syndrome related. The median age at diagnosis for the entire cohort was 70 years (72.5 y for head and neck), with 95% being white. Of those with head and neck angiosarcoma, 82% were male. Wilson-Jones first distinguished a unique form of angiosarcoma developing in the face and scalp of elderly individuals, noting that it carries a relatively poorer prognosis than the other forms. This form of angiosarcoma is also known as senile angiosarcoma or malignant angioendothelioma. Currently, angiosarcoma of the face and scalp in elderly patients is recognized as a distinctive subgroup. The estimated ratio of male-to-female predominance is approximately 3:1. 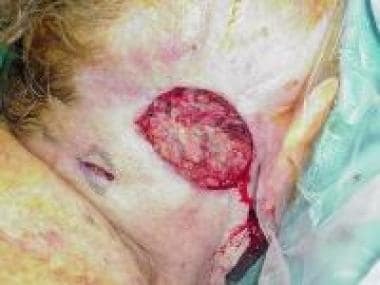 The most common presentation of a scalp angiosarcoma involves lesions that are single or multifocal; bluish or violaceous; nodules, plaques, or flat infiltrating areas; and occasionally may bleed or ulcerate. Most often, the tumors are on relatively exposed skin, either with no or very thin hair. 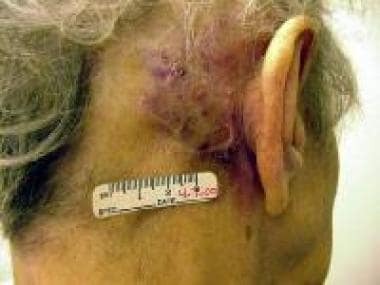 Cutaneous angiosarcomas primarily affect elderly persons and are usually located on the head and neck, particularly in the area of the scalp and upper forehead. Most cutaneous angiosarcoma appears on the scalp or upper forehead. Angiosarcoma of the face and scalp is insidious, and its clinical manifestations vary widely. In the early stages, angiosarcoma of the face and scalp frequently appears clinically innocent. The lesions may be single or multifocal; bluish or violaceous; nodules, plaques, or flat infiltrating areas; and occasionally may bleed or ulcerate. Most early lesions begin as ill-defined, bruiselike areas with an indurated border. More advanced lesions can be elevated, nodular, or occasionally ulcerated. Grossly, the tumors may appear as ill-defined, hemorrhagic areas. Extensive local growth is common, and margins are difficult to define surgically. Multifocality is noted in approximately half the patients. Metastasis to regional lymph nodes and to the lungs can occur, often after repeated surgical excisions of the primary growth. In these patients, the prognosis is poor. As reported by Weedon and Freedman, this may reflect the fact that clinical diagnosis is often delayed until the lesions are advanced. Still, even very small tumors can extend microscopically far beyond the visible boundaries of the lesion. Histologically, early lesions may show benign, capillary, hemangiomalike structures. This pattern, however, is deceiving, because angiosarcoma usually has an aggressive course. Microscopically, angiosarcoma often shows extensive involvement of the dermis, with poorly differentiated tumors also invading deep structures such as fascia and subcutis. The histopathologic features of angiosarcoma are diverse. The 3 histologic patterns are vascular channels, sheets of cells, and cells of undifferentiated morphologic features. In some lesions, more than one pattern may be present. Low-grade angiosarcoma is a well-differentiated lesion that retains some of the functional and morphologic properties of normal vascular endothelium. Well-differentiated lesions form distinct vascular channels, although these are often irregular in shape and size. Unlike benign hemangiomas, well-differentiated angiosarcoma forms vascular channels that create its own tissue planes as it dissects through the dermal collagen. In addition, unlike normal epithelium, angiosarcoma is characterized by cells with larger and more chromatic nuclei, with cells often piling up along the lumina, creating papillations. Low-grade tumors have infrequent mitoses. In poorly differentiated (high-grade) tumors, sheets of pleomorphic cells may resemble a carcinoma. The vascular anastomosing channels typically observed in angiosarcoma are lined by atypical endothelium that can be either a single row of cells or multiple layers thick. In highly cellular tumors, the neoplastic process causes such close approximation of cells within vascular spaces that the tumor may appear solid. Higher-grade lesions have areas of hemorrhage, disordered architecture, and large cells with hyperchromatic, pleomorphic nuclei. Cells often display prominent mitotic activity. Occasionally, tumors may have well-differentiated areas, but often they are composed exclusively of poorly differentiated areas. Tumor size may affect prognosis. Weiss and Goldblum report tumors less than 5 cm in diameter are associated with a significantly better prognosis than larger lesions. Holden et al analyzed patients with tumors smaller than 5 cm, 5-10 cm, and larger than 10 cm and demonstrated a statistically significant correlation between tumor size and survival rate. Multiple studies have compared tumors larger and smaller than 5 cm, all concluding that smaller tumors have a better overall prognosis for overall survival (OS) and/or disease-free survival (DFS). Perez et al, Maddox and Evans, and Pawlik et al report smaller (< 5 cm) tumors are associated with significantly longer OS and DFS. [8, 16, 1] In the most recent of these studies, Perez et al showed median 5-year OS of 48.4% for smaller than 5 cm versus 11.5% for larger than 5 cm. Thus, one of the most important factors in determining prognosis with cutaneous angiosarcoma appears to be initial lesion size. Other factors have a less substantial effect on prognosis. Maddox and Evans found that patients with moderate or marked lymphocytic inflammatory responses in the tumor survived longer (P = .002). Pawlik et al noted that patients with multifocal disease had decreased DFS compared with patients who had only one lesion. In contrast, tumor grade did not appear to correlate with survival. Holden et al also could not correlate histopathologic grade with survival outcome. Despite this, some researchers contend that low-grade tumors have a more indolent course and a better prognosis than high-grade lesions. The optimum treatment of cutaneous angiosarcoma has not been defined. Generally, radical surgery and postoperative radiotherapy are advocated to treat patients with these tumors. In many patients, surgery often is not feasible because of the multifocal nature and local spread pattern of these tumors. Achieving a negative surgical margin is frequently difficult in patients with scalp angiosarcoma because of the extensive microscopic spread common with this disease. To assist in achieving negative margins, intraoperative frozen specimens are often obtained to help guide the extent of the resection. Given the poor results obtained with surgery alone, radiation therapy has been offered as possible adjuvant therapy. Although some authors report that radiation therapy provides no benefit, others have suggested that surgery combined with radiation therapy offers the best prognosis. Mark et al reported improved disease-free survival (DFS) with the addition of radiation therapy to surgery. Similarly, Hodgkinson et al from the Mayo Clinic reported that the only 2 survivors in their series underwent surgery and received radiation therapy. Pawlik et al reported that a prior history of radiation therapy strongly impacted survival upon both univariate and multivariate analyses. In fact, patients who received radiation therapy had a median survival almost 4 times longer than patients who did not receive radiation therapy. Morrison et al noted, however, that angiosarcoma often recurs at the radiation-field margins, sometimes at striking distances from clinically evident disease. Additionally, the disease often recurs at regional and distant sites. For these reasons, the development of new approaches, including more effective local and systemic therapy, is gravely needed. The primary treatment for scalp sarcoma of all histologic types is wide surgical excision to histologically negative margins whenever possible. As noted above, achieving a negative margin is frequently difficult in angiosarcoma patients because of the extensive microscopic spread common with this disease. Therefore, in trying to achieve a negative margin, a wound is created that almost never can be closed primarily. In this clinical setting, the reconstructive surgeon is faced with the dilemma of either (1) performing a primary reconstruction and potentially discovering later that further excision, possibly including sacrifice of the entire reconstruction, is necessary, or (2) performing a staged reconstruction after final confirmation of the margin status has been obtained. The authors prefer the latter approach, although it mandates a second surgical procedure for all patients. Each option is useful in different situations. Staged reconstruction is the principal treatment of angiosarcoma of the scalp. Because most patients are elderly, the preferred reconstructive algorithm is skin grafts initially, followed by rotation flaps, and, finally, free-tissue transfer. (See image below). Although treatment of scalp angiosarcomas mandates excision to negative margins (when possible), plastic reconstruction should be delayed. Homograft is initially used to temporarily reconstruct the scalp. Homograft has the advantage of being a durable skin substitute for 5-7 days. Once the pathology report shows definitive clear margins, the patient is returned to the operating room for a staged reconstruction. Typically, oncologic principles require that permanent sections confirm free margins. Therefore, the large defects created after resection must have some type of temporizing reconstruction. This aspect of the case is important because preserving the pericranium allows the use of skin grafts, the simplest form of reconstruction. Rarely does tumor removal require resection of the pericranium, thus preventing the use of a skin graft as the first option; previous radiotherapy is the only possible exception to using skin grafts initially. Regardless of the clinical scenario, the authors commonly use cadaveric homografts to temporarily reconstruct the scalp. Access to a skin bank with an available supply of homografts is necessary to reliably use this technique. Once the homograft is thawed, place it on the wound just like a skin graft and secure it in place with staples, Xeroform gauze, and a compressive type of head dressing such as self-adhering foam. Usually, the dressing remains on the wound for approximately 1 week, while the pathologist provides margins on the surgical specimens. Homograft has the advantage of being a durable skin substitute for 5-7 days before a purulent exudate develops beneath the graft. When the margins are free, the patient is returned to the operating room for a staged reconstruction. Other authors have described the use of bovine collagen constructs for reconstruction of full-thickness scalp defects created after resection of angiosarcoma. In one study, 23 patients were treated with bovine constructs for defects with an average size of 51 cm. Histologic studies demonstrated persistence of the construct and infiltration of nascent fibroblasts. Skin grafting of the area was accomplished at an average of 30 days from the time of the initial reconstruction with bovine collagen construct. Local rotation flaps derived from the patient's scalp are the standard when flaps are used to reconstruct the wound. The authors strongly prefer to take large scalp flaps based on single areas, rotate them into the defect, and then graft the donor site. This allows trimming of the skin flap to be placed, while providing the patient with a healed wound for adjuvant radiotherapy. The Crane principle, whereby the flap is used only temporally on the tumor defect, is never used in sarcoma reconstructions because of the potential spread of the tumor. 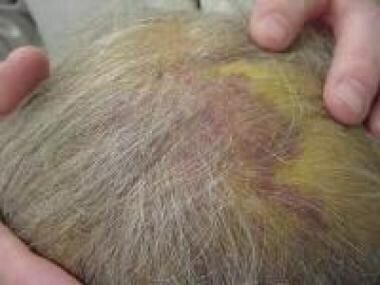 The use of multiple skin flaps is uncommon because they open large areas of scalp to tumor spread. Reserve free-tissue transfer for patients with angiosarcoma who have high-quality donor vessels for the free-tissue transfer. This problem is usually the limiting step for this operation and is often related to patient age. In the authors' institutions, the rectus muscle flap is the prime free-tissue transfer muscle. This may change with the advent of laparoscopic harvesting of the omentum. The rectus muscle is durable, and the patient's body position is such that the flap can be harvested while the ablative cancer procedure is being performed. Free-tissue transfer is the most complex reconstructive procedure and is the least used technique in elderly patients. The role of adjuvant chemotherapy in treating angiosarcoma is poorly defined. In a series from the University of California-Los Angeles, 4 of 6 patients who underwent surgery and received radiation and chemotherapy were disease free. Other investigators have concluded that in patients with nonextremity soft-tissue sarcoma, adjuvant chemotherapy offers no statistically significant benefit for survival. Other investigators have examined the use of intra-arterial chemotherapy using pegylated liposomal doxorubicin in combination with intralesional injections of interferon alfa (IFN-alfa). This treatment strategy may be a promising innovative therapeutic option for localized scalp angiosarcoma. Evidence indicates that the poor prognosis in certain cancers may be associated with alterations in humoral and cellular immunity, and therapy with immunomodulators such as interferons and interleukins may be successful alternatives to chemotherapy. Ulrich et al reported on the long-term survival of an 88-year-old woman with angiosarcoma of the scalp using a combination of intralesional cytokines (ie, IFN-alfa and interleukin 2) and several courses of surface irradiation. This combination therapy led to a 2-year remission of both the tumor and the ultrasonographically suspicious cervical lymph nodes in this patient, whose lesion was quite extensive (20 X 15 cm). Other investigators, however, have reported that tolerance of IFN-alfa is poor, and, when used alone, it does not appear to be an effective treatment of scalp angiosarcoma. Angiosarcoma of the scalp is a rare, aggressive, and difficult to treat tumor that primarily affects older individuals. Surgeons need to be familiar with these tumors and must be aware of the extremely high risk of local recurrence despite aggressive treatment. Staged reconstructions should be considered in most patients so that definitive reconstruction can be performed after the wide excision margins are found to be negative on permanent section analysis. Postoperative radiation, if used, should be given in a wide field, beyond the apparent edge of the tumor, and should not be applied in a "postage stamp" fashion. New treatment approaches are urgently needed. What is angiosarcoma of the scalp? What is the prevalence of angiosarcoma of the scalp? Where does cutaneous angiosarcoma of the head and neck typically manifest? What causes angiosarcoma of the scalp? Which physical findings are characteristic of angiosarcoma of the scalp? Which histologic findings are characteristics of angiosarcoma of the scalp? What is the prognosis of cutaneous angiosarcoma of the scalp? How is angiosarcoma of the scalp treated? What is the role of reconstructive surgery in the treatment of angiosarcoma of the scalp? What is the role of cadaveric homografts in reconstructive surgery for angiosarcoma of the scalp? What is the role of bovine collagen constructs in reconstructive surgery for angiosarcoma of the scalp? What is the role of rotation flaps in reconstructive surgery for angiosarcoma of the scalp? What is the role of free flaps in reconstructive surgery for angiosarcoma of the scalp? What is the role of chemotherapy in the treatment of angiosarcoma of the scalp? What is the role of immunomodulators in the treatment of angiosarcoma of the scalp? What are the advantages of staged reconstruction in the treatment of angiosarcoma of the scalp? What is the role of postoperative radiation in the treatment of angiosarcoma of the scalp? Perez MC, Padhya TA, Messina JL, Jackson RS, Gonzalez RJ, Bui MM. Cutaneous angiosarcoma: a single-institution experience. Ann Surg Oncol. 2013 Oct. 20(11):3391-7. [Medline]. Spiker AM, Ramsey ML. Cancer, Angiosarcoma. 2018 Jan. [Medline]. [Full Text]. Albores-Saavedra J, Schwartz AM, Henson DE, et al. Cutaneous angiosarcoma. Analysis of 434 cases from the Surveillance, Epidemiology, and End Results Program, 1973-2007. Ann Diagn Pathol. 2011 Apr. 15(2):93-7. [Medline]. Guadagnolo BA, Zagars GK, Araujo D, Ravi V, Shellenberger TD, Sturgis EM. Outcomes after definitive treatment for cutaneous angiosarcoma of the face and scalp. Head Neck. 2011 May. 33(5):661-7. [Medline]. Ambujam S, Audhya M, Reddy A, Roy S. Cutaneous angiosarcoma of the head, neck, and face of the elderly in type 5 skin. J Cutan Aesthet Surg. 2013 Jan. 6(1):45-7. [Medline]. [Full Text]. Morrison WH, Byers RM, Garden AS, Evans HL, Ang KK, Peters LJ. Cutaneous angiosarcoma of the head and neck. A therapeutic dilemma. Cancer. 1995 Jul 15. 76(2):319-27. [Medline]. Maddox JC, Evans HL. Angiosarcoma of skin and soft tissue: a study of forty-four cases. Cancer. 1981 Oct 15. 48(8):1907-21. [Medline]. Lydiatt WM, Shaha AR, Shah JP. Angiosarcoma of the head and neck. Am J Surg. 1994 Nov. 168(5):451-4. [Medline]. Isogai R, Kawada A, Aragane Y, Tezuka T. Successful treatment of pulmonary metastasis and local recurrence of angiosarcoma with docetaxel. J Dermatol. 2004 Apr. 31(4):335-41. [Medline]. Freedman AN. Angiosarcoma of the scalp: case report and literature review. Can J Surg. 1987 May. 30(3):197-8. [Medline]. Shin JY, Roh SG, Lee NH, Yang KM. Predisposing factors for poor prognosis of angiosarcoma of the scalp and face: Systematic review and meta-analysis. Head Neck. 2017 Feb. 39 (2):380-6. [Medline]. Suzuki G, Yamazaki H, Aibe N, et al. Clinical Usefulness of the Platelet-to Lymphocyte Ratio in Patients with Angiosarcoma of the Face and Scalp. Int J Mol Sci. 2017 Nov 13. 18 (11):[Medline]. [Full Text]. Weiss SW G J. Enzinger and Weiss's Soft Tissue Tumors. 4th ed. St. Louis, MO Mosby; 2001. Holden CA, Spittle MF, Jones EW. Angiosarcoma of the face and scalp, prognosis and treatment. Cancer. 1987 Mar 1. 59(5):1046-57. [Medline]. Pawlik TM, Paulino AF, McGinn CJ, et al. Cutaneous angiosarcoma of the scalp: a multidisciplinary approach. Cancer. 2003 Oct 15. 98(8):1716-26. [Medline]. Cassidy RJ, Switchenko JM, Yushak ML, et al. The importance of surgery in scalp angiosarcomas. Surg Oncol. 2018 Dec. 27 (4):A3-A8. [Medline]. [Full Text]. Bernstein JM, Irish JC, Brown DH, et al. Survival outcomes for cutaneous angiosarcoma of the scalp versus face. Head Neck. 2017 Jun. 39 (6):1205-11. [Medline]. Ogawa K, Takahashi K, Asato Y, et al. Treatment and prognosis of angiosarcoma of the scalp and face: a retrospective analysis of 48 patients. Br J Radiol. 2012 Nov. 85(1019):e1127-33. [Medline]. [Full Text]. Farhood AI, Hajdu SI, Shiu MH, Strong EW. Soft tissue sarcomas of the head and neck in adults. Am J Surg. 1990 Oct. 160(4):365-9. [Medline]. Mark RJ, Tran LM, Sercarz J, Fu YS, Calcaterra TC, Juillard GF. Angiosarcoma of the head and neck. The UCLA experience 1955 through 1990. Arch Otolaryngol Head Neck Surg. 1993 Sep. 119(9):973-8. [Medline]. Oashi K, Namikawa K, Tsutsumida A, et al. Surgery with curative intent is associated with prolonged survival in patients with cutaneous angiosarcoma of the scalp and face -a retrospective study of 38 untreated cases in the Japanese population. Eur J Surg Oncol. 2018 Jun. 44 (6):823-9. [Medline]. Hodgkinson DJ, Soule EH, Woods JE. Cutaneous angiosarcoma of the head and neck. Cancer. 1979 Sep. 44(3):1106-13. [Medline]. Hwang K, Kim MY, Lee SH. Recommendations for therapeutic decisions of angiosarcoma of the scalp and face. J Craniofac Surg. 2015 May. 26 (3):e253-6. [Medline]. Patel SH, Hayden RE, Hinni ML, et al. Angiosarcoma of the scalp and face: the Mayo Clinic experience. JAMA Otolaryngol Head Neck Surg. 2015 Apr. 141 (4):335-40. [Medline]. Shkoukani MA, Carron MA, Tulunay O, Kucuk O, Lin HS. Angiosarcoma of the scalp with complete response to a biweekly gemcitabine and docetaxel (GEMDOC) chemotherapy regimen. Ear Nose Throat J. 2011 Jan. 90(1):E26-9. [Medline]. Bong AB, Bonnekoh B, Schön MP, Gollnick H. Treatment of scalp angiosarcoma by controlled perfusion of A. carotis externa with pegylated liposomal doxorubicin and intralesional application of pegylated interferon alfa. J Am Acad Dermatol. 2005 Feb. 52(2 Suppl 1):20-3. [Medline]. Ulrich L, Krause M, Brachmann A, Franke I, Gollnick H. Successful treatment of angiosarcoma of the scalp by intralesional cytokine therapy and surface irradiation. J Eur Acad Dermatol Venereol. 2000 Sep. 14(5):412-5. [Medline]. Disclosure: Serve(d) as a director, officer, partner, employee, advisor, consultant or trustee for: Amgen, Provectus, Castle Biosciences, Delcath Systems<br/>Serve(d) as a speaker or a member of a speakers bureau for: Amgen<br/>Received research grant from: Delcath Systems, Amgen, Castle Biosciences, Provectus<br/>Received income in an amount equal to or greater than $250 from: Amgen, Castle Biosciences, Delcath Systems.